– but will that satisfy the gas network operators? A new report from consultancy Navigant (formerly Ecofys) concludes that the potential of domestically produced renewable gas and especially hydrogen in Europe is much higher than previously thought. Commissioned by a consortium of seven European gas transport companies and two renewable gas industry associations, the report says it will lead to even greater savings than expected previously. “But it’s not just a good news show for the gas sector,” says Kees van der Leun, a director at Navigant who was involved in the analysis. 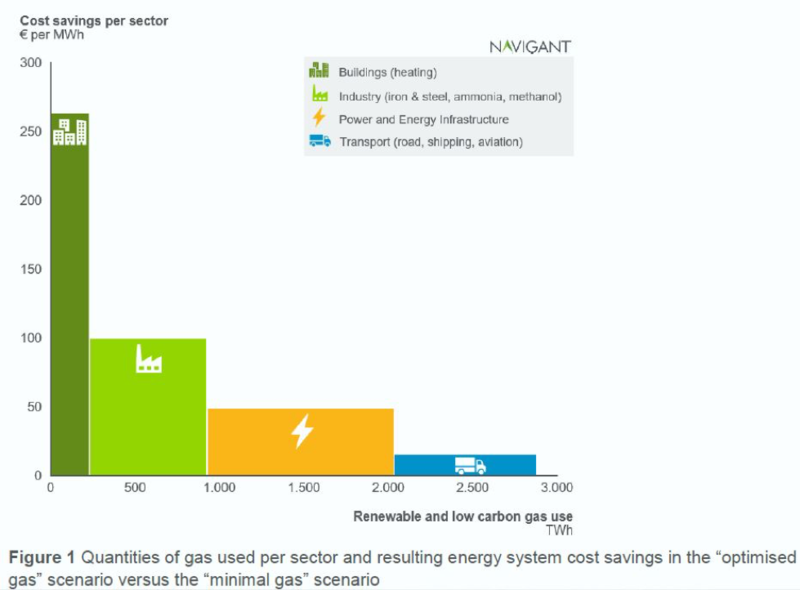 The new study, Gas for Climate, which came out March 18, is a follow-up to a similar study done by Navigant last year and its findings are much more upbeat: it shows that substantially larger gas volumes (270bn m³ instead of 122bn m³) and much greater cost savings (€217bn/year instead of €138bn) are possible in 2050 than the previous study had projected. These new findings will no doubt be welcome news to the companies that commissioned the report: gas network operators Enagas, Fluxys, Gasunie, GRTgaz, Open Grid Europe, Snam and Terega, as well as the European Biogas Association and Consorzio Italiano Biogas. Given the EU’s ambitious climate policies, which may leave little or no room for natural gas around 2050, gas network operators are currently facing an uncertain future. True, there has been a strong push in Europe in recent years to promote “renewable gas” (biogas, biomethane, “green hydrogen”) and “decarbonised gas” (“blue hydrogen”, based on natural gas with carbon capture and use or storage) as alternatives to fossil-based natural gas. The deputy-director general for energy at the European Commission, Klaus-Dieter Borchardt, recently told NGW he is optimistic that the European gas industry will be able to continue to play an important role in the zero-emission energy system of the future, by switching from natural gas to CO2-free alternatives. He is not alone. Nearly all the EU member states meeting in Austria last September signed the Hydrogen Initiative, a political declaration “to maximise the great potentials of sustainable hydrogen technology for the decarbonisation of multiple sectors, the energy system and for the long-term energy security of the EU.” And the Linz declaration will get a follow-up next week: at the April 2 meeting of the EU Council of Ministers in Bucharest, the energy ministers of EU member states will be asked to sign a similar declaration, this time promoting “a Sustainable and Smart Gas Infrastructure” for Europe. However, despite all this enthusiasm for alternative gases, there is an elephant in the room that the declarations don’t mention: the amount of renewable gas and hydrogen likely to be needed in the low-carbon energy system of 2050 will be much lower than the amount of natural gas used today. Renowned gas expert Jonathan Stern of Oxford Institute for Energy Studies (OIES), observing that the potential of alternative gases in Europe is quite limited, recently warned that unless the gas industry starts developing blue hydrogen on a large scale, it faces an “existential threat”. Stern noted that among a number of studies that had looked at the potential of domestically produced renewable gas and hydrogen in Europe, by far the most ambitious one projected a maximum of 122bn m³ in 2050 – no more than about a quarter of current European natural gas demand. Most other studies had even lower numbers. Ironically, that most positive study was the first Gas for Climate study produced by Navigant, which came out in February 2018. In that report the researchers concluded that the availability of domestically produced renewable methane (biogas/biomethane) would be 98bn m³ and for green hydrogen just 24bn m³ – a fraction of current EU gas demand which is between 450bn m³/yr and 500bn m³/yr. How did Navigant arrive at these much higher numbers, I asked Kees van der Leun, a director at Navigant who reviewed the study? Van der Leun notes that the estimate for biogas and biomethane is not much different from last year’s. Navigant’s projections of available biogas did receive some criticism last year, in particular from the International Council on Clean Transport, who published a briefing in October 2018, which arrived at a much lower potential for renewable methane. According to the ICCT, the assumptions in the first Gas for Climate report about the potential of “sequential cropping” (harvesting more than one crop within one year, which makes it possible for farmers to produce feedstock for biomethane that does not replace food) were too optimistic. But Van der Leun says Navigant’s view on the potential for sequential cropping is based on “an optimised concept developed in Italy in the Biogasdoneright project, an innovative way of farming, which increases agricultural productivity of existing farmland sustainably”. The potential of this kind of farming in northern Europe is more limited, Van der Leun admits, but he says the Navigant researchers found it can still make a significant contribution. In addition, says Van der Leun, last year’s report focused mainly on heating and electricity production. The new report includes industry and transport. Another question is whether 270bn m³/yr of alternative gases, if they arrive, will save European gas infrastructure companies. After all the companies will see their business go down by half compared with today. 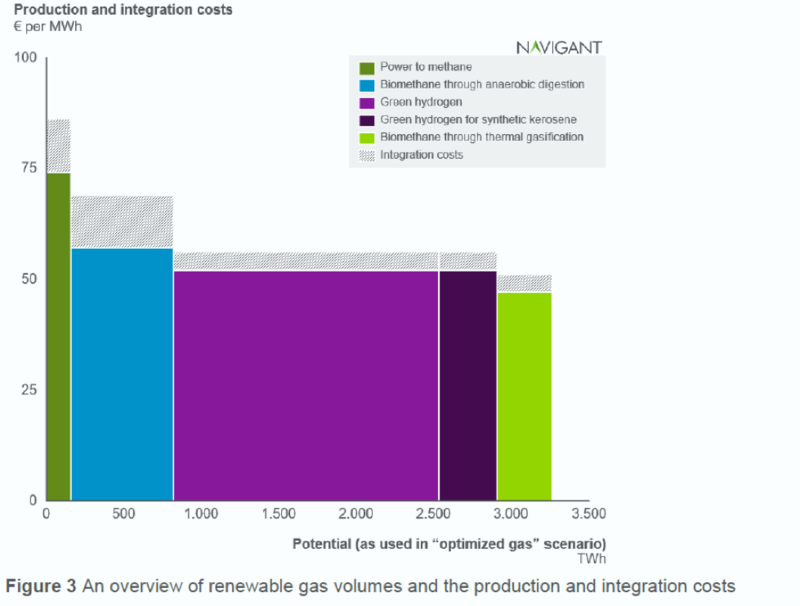 The new Gas for Climate study by consultancy Navigant compares an optimised gas scenario with a minimal gas scenario.